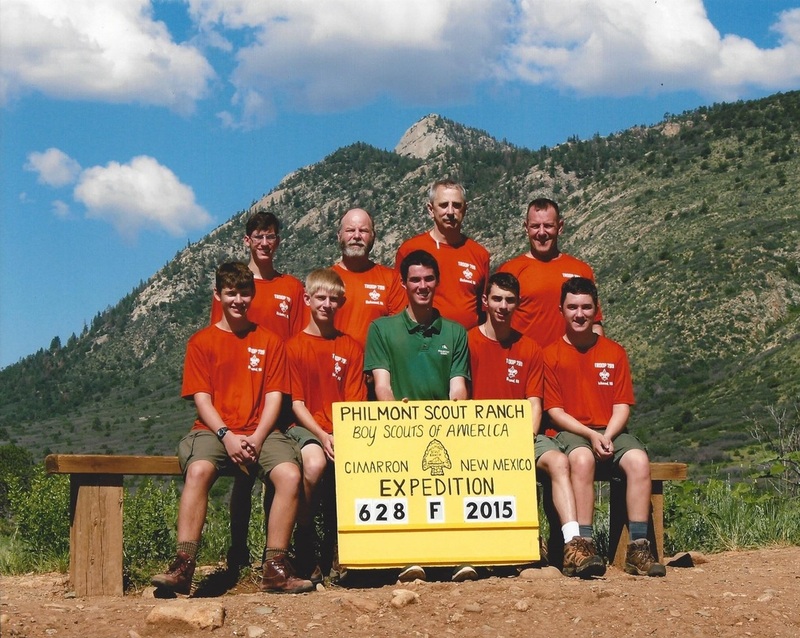 On June 27, 5 youth and 3 adults headed out on a plane to Philmont from Troop 799. Everyone met at the airport very early in the morning where we went through the airport security and began our journey. We went from Richmond to Dallas to Colorado Springs. In Colorado Springs, we were met by a bus and our Blue Sky Adventure guide. In Colorado Springs, we got to visit the Air Force Academy and then do a short hike through the Garden of the Gods. We then stayed in the Marriott hotel that night. The next morning we woke up really early to get on a bus to Philmont. When we got to Philmont after a few hours, we were met by our guide, Liam, and went through the whole registration process and slept there for the night in "tent city". While there, our Crew Leader and Adviser went through logistics, and the crew got to check out the Tooth of Time Traders. After breakfast in base camp, we got our stuff together and got on a bus with our guide to Ponil Turnaround. 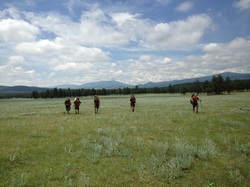 From there we received our orientation on most things Philmont and started with a short hike to Ponil. Once we got to Ponil we heard about the result of the flash flooding in the area and could see that one of the cabins at Ponil was swept off its foundation. There, we got to check out our first swap box and get a few things branded. After that, we set off for our first night a couple miles away at Sioux campsite. There, we learned the ropes of the bear bags and how to setup the campsite including the Bear-muda Triangle. The next morning we headed off to Dan Beard, a staff camp, which would start our time with Leave No Trace Camping. This involved LNT bear-lines and no campfires. Our ranger, Liam taught us how to set the LNT bear-lines up at our campsite. In the Northern country, you could see the results from the 2002 Ponil Complex Fire that burned down miles and miles of trees. At Dan Beard we took part in some team building activities which offered quite the challenge. The staff at Dan Beard were very nice, and we even met one of them who goes to VCU. We also go to check out the swap-box that they had. The next morning, we said goodbye to our ranger and he left us with a pound cake for Franklin's birthday. We then headed on to Seally Canyon campsite, but not without a lovely afternoon rain-shower/ lightening storm to brighten our hike. Before the storm, we actually spotted a herd of elk about two football fields away from us along the trail. We continued hiking through the storm and ended up walking a couple miles the wrong way. Everybody kept going though, and we were still able to make it to Seally Canyon, a staff camp, in time. The program offered was Search and Rescue so we learned about that as well as a Full Body pat-down for an injured person. Once we had been educated, we were taken upon surprise to have one of our own Scout leaders missing, so we took part in a drill where we had to safely rescue Mr. Graff and use all the skills we had just learned. That night we had a massive thunderstorm, but fortunately everyone was mostly dry in their tents. The next morning however, we discovered all our boots were water-logged as the dining fly had blown over. We continued though and headed onto Whiteman Vega, but not first without stopping at Ring Place, a historic farm and Philmont Staff Camp, to pick up our food from the commissary. At Whiteman Vega, we did our conservation project which was moving rocks into the dirt road to ensure the supply trucks with food could make it to the staff camp and their Yurt. After that, it was too late to start, but Whiteman Vega also offered a cool Mountain Biking Program. Once again, that night we had a wonderful thunderstorm that was rather entertaining to watch. You could also see the cattle from the campsite we were at as well. This time, everybody kept their boots under their tents' rain-flies. After an extended morning packing up our rather tent belongings from the night before, we set off from Whiteman Vega towards Iris Park. Along this trip, we went back through Ring Place and continued through the Valle Vidal meadow-walking. We were encountered with a nice afternoon shower on our way, however we weren't too upset because the views were so cool. Iris Park was a nice trail camp that was filled with many crews that night. We were able to meet some cool people, as well as camp right up on an incline with a nice view of the mountains despite the burned down trees from the 2002 Ponil Complex Fire. The next morning the crew packed up quickly to get set for a long trip to Upper Greenwood. However, before packing, we realized that it was July 4th. Upon this realization, one of the Scouts had the Star Spangled Banner recorded on his phone which had been brought along the trip to take pictures. Everyone sang it and enjoyed our simplistic celebration. After singing we headed out of the campsite before most of the other crews. This was one of the first days that we had to climb a bit of altitude. We had to go up and over a ridge, but after that, we got to walk in a really cool looking valley. Along this valley there were two rather large stream crossings that we encountered. Before both streams, we stopped for some Scouts to put on their Crocs, while others dared to brave walking on some rather thin fallen trees lying across the streams. Fortunately everyone made it across without boots that were too wet. We made it in very good time to one of the lower Upper Greenwood campsites and we were able to get settled before the afternoon storm was supposed to hit. This time however, it passed by us with only a couple drops. In this odd campsite that was situated on the side of a mountain, we found it rather difficult to put up our LNT bear-lines, but in a group effort we were able to do it. After packing up again, we set out the next morning for what we had heard so much about, Baldy Town. This however was not an easy trip. The beginning of the day involved an almost completely straight up hike along some switch-backs that proved to be quite challenging. We kept pushing and soon realized how high up we were. At this point, we realized we had some cell-phone service as we were about 11,000 feet high, so some guys were able to call home. We still needed to continue though, so we hiked to the top of this mountain that is right next to Baldy Mountain but was about 1,000 feet shorter. We got some cool views, and had to head down this unnamed mountain to get to our destination. Along the way there were some great pictures of the cone of Baldy Mountain. Once we made it to the bottom, we headed from Copper Park to French Henry on some flat land. We visited French Henry where we were able to each try some metalworking as well as pan for gold in the stream. Unfortunately nobody was able to find gold, but it was a really neat experience. By this time it was almost dinner-time, so we set out for Baldy Town. We were able to make it in just before the commissary closed at 6 and make dinner. Baldy Town had a commissary, a museum, a trading post, and even a shower house! The area used to be a mining town with some pretty neat history. We made sure to get some sleep though as the next day we planned to hike up Baldy. We were also overjoyed to be able to use Philmont bear lines and build fires because we had entered back into Philmont property and we were out of the Valle Vidal. The next morning we had to wake up very early and pack our day-packs to hike up Baldy Mountain. We started hiking around 6:45 am and were able to make it up in good time. The beginning of the trail featured some gradual road switchbacks to head up the mountain. As we continued, the trail got steeper, until you could see the rocks that make up the cone of Baldy Mountain. Once we began hiking on the rocks, the trail became ridiculously steep and offered for an interesting hike. Although it was very challenging, including the altitude change and temperature change as you go up, everyone was able to make it to the top. On the top, we were actually standing in between two cloud layers. One cloud layer was below us while we could see the other one above us. When we got to the summit, we were able to see as far as the eye can see to one side, but soon the clouds moved in. It was rather chilly at the top, so everybody had to bring their warmest gear to the top, but everyone felt great that we had made it to the top of Baldy Mountain, 12,441 feet above sea level. On the way back down, it was quite a trip as the incline of the mountain was so steep. We found ourselves almost sliding down with the rocks under our feet. A hiking pole was a very helpful tool during the descent. After coming back down to Baldy Town, we all had the chance to wash up in the shower house, visit the trading post, and check out the museum. The museum became a popular place in the afternoon because it began to pour outside and there was a fireplace in the museum as well as shelter. The rain continued, but the crew was able to have dinner and rest after the big day back at our campsite in Baldy Town. On the day after hiking Baldy Mountain, we had to dry out some of our gear after a rainy afternoon and night. After packing up, we set off for the campsite known as Baldy Skyline. This day was filled with rain and fog which made for an interesting hike. We stopped for lunch in Ewells Park, a trail camp, on the way, where we found some big trees to shelter us from the rain while we ate. The rain didn't stop, and we didn't either, so we set off for Baldy Skyline, pushing through the rain. Before we knew it, we arrived at the trail sign marking Baldy Skyline campsite. We found the best campsite in Baldy Skyline and stayed there. However due to the fog, we could not find the skyline. With the extra time we had, we attempted to build a fire to dry our gear. After a few attempts, we were able to build a small fire. Around this small campfire, we were able to catch up on our Philmont devotionals and have a nice reflection. The next day, we headed our from Baldy Skyline to the place where we started, Ponil. On the way, we stopped in Pueblano, a popular staff camp, to check out the swap-box and see what they had to offer. We didn't have time to do it, but they offered telephone poll climbing which looked quite scary. We continued though, as this was our last official day on the trail and we were anxious to get back to Ponil. There were some fun mountain creek crossings that we encountered on the way to Ponil and everyone hiked eagerly as we knew we had almost made it. Once we finally made it to Ponil, we celebrated as we had essentially completed our trek. We signed in with the staff and were able to sign up for the Cowboy Action Shooting. Everyone was given the chance to shoot a rifle, a pistol, and a double-barrel shotgun. After the shooting, we were given the opportunity to take part in a chuck-wagon dinner. There, we had stew, cornbread, and cobbler to share with a bunch of other crews, served out of a chuck-wagon. To cap off the day, we went to the Cantina to check out the Cantina Show. The show was probably the highlight of some of the guys' treks as the staff performing were great and very entertaining. On our last day on the trail, we packed up in Ponil and said goodbye to all the great staff at Ponil. From there, we hiked a little over a mile to Ponil turnaround to be picked up by a bus. Once we made it to the bus, we were all exhausted, yet overjoyed that we had made it officially. The bus took us back to base camp where we were able to clean our gear, buy souvenirs in the Tooth of Time Traders, and charge our phones for the trip back home. Most importantly, everyone got to shower and use the laundry-mat available at base-camp. That night we had the chapel service and then the closing campfire, where we got another great performance from the staff, and our Crew Leader accepted the award for everyone completing the trek. The next morning we got up and ate our last meal at the base-camp dining hall. We also donated one of our Troop 799 Philmont 2015 shirts to be hung up in the dining hall. Everybody made their last purchases at the Tooth of Time Traders, and then we all got on our Blue Sky Adventures bus. The bus took us back to the Colorado Springs Airport where we got on the plane from Colorado Springs, to Dallas, Texas, to Richmond, Virginia where we met our parents just around midnight in Eastern Time. Everyone completed the trip, and made lots of lasting memories that Philmont leaves with everyone. Make sure to follow the packing list well or you will have to break the bank at the Tooth of Time Traders buying gear. This includes a beanie, a long-sleeve shirt, a pack-cover, a 30 degree or below sleeping bag, a rain jacket, 4 L worth of water bottles, and a broken-in pair of boots. During the end of June and beginning of July, at Philmont there is a thing called "monsoon season". It rains almost every day, so be prepared with waterproof boots, a pack cover, a good rain jacket, and maybe even some rain pants. There really isn't much cell-phone service at all at Philmont. The service at base-camp is very spotty, and the only other place you will get service is on top of Baldy. So unless you plan on using your phone for taking pictures, you won't really need it. Don't put the icing in your backpacks, it will explode and you will have to hang your backpack on the bear-line each night. 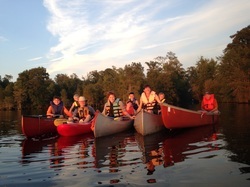 On the weekend of August 21st, 2015, the Troop went on a weekend summer canoe trip again with 9 Scouts and 5 adults. This year we went to Lake Drummond through the Great Dismal Swamp Canal. Last year, we did a bike trip on the path right next to the canal. We put our boats in on Friday night at the canal and canoed only with our headlamps and glow sticks. After about two hours, we made it to the campsite which marked the access point into Lake Drummond. We were amazed at how nice the campsite was, as there was a nice dock, recently cut grass, overhead lights, running (not potable) water, electrical outlets, working bathrooms, and a few shelters. Saturday morning, we moved our canoes and kayaks over the small little peninsula we were on to get to the other side. There was a little tram on a track meant to move boats, but it didn't work anymore. We then headed towards the lake from there and fulfilled all the requirements for the Canoeing Merit Badge, including swamping a canoe and flipping it back over. After finishing the Merit Badge, we headed back to the camp to eat dinner and build a fire. Despite being tired, most of the group went back out on the lake again to watch the sun set which was an incredible sight along the water. The next morning, everyone packed up and canoed back along the canal to the boat landing and headed home. Overall, it was a great trip and everyone had a great time. Troop 799 went caving with the wild GUYdes in Bridgewater, Virginia. We went down into the largest cave in Augusta County where we learned about the dangers of caving and the safety procedures we must follow while caving. The guide took us to the many unique parts of the cave which included the commando crawl, the dungeon, and the crypt. We also got a taste of vertical climbing and had a fun time helping each other out. We ended up back at the entrance and took an after picture of the group now completely covered in mud. This was a great experience that everyone loved! Thanks to Nicholas S. for writing this, to Mr. Goodman for planning the trip, and to Mr. Jones for the pictures. The Troop held the annual Summer Court of Honor at Deep Run Park on May 31, 2015. We had lots of awards, good food, and good weather to celebrate the year. Thank you to Mr. Jones for the pictures. This past Monday night at the last Troop Meeting of the school year, the Troop had the Annual Dodgeball Tournament. It was held in the parking lot of Trinity UMC. The winning patrol was the Green Bar Patrol who won over the Spartan Patrol in the final. On Memorial Day (Monday, May 25, 2015), Troop 799 had a few Scouts sign the Pledge of Allegiance in American Sign Language at the Virginia War Memorial's Memorial Day Ceremony. Among the speakers at the ceremony were state military officials and Governor Terry McAuliffe himself. This was all coordinated by Mr. Sofinski who works as a Sign Language Interpreter and taught our guys how to sign the Pledge of Allegiance. According to news sources, there were about 1,500 people at the ceremony. The Troop 799 Philmont crew went on a shakedown hike on Priest Mountain in Nelson County, Virginia. A crew of five Scouts and three adults backpacked up the mountain and camped at the top among some other Boy Scout Troops making the hike on a beautiful day for hiking. Everyone ate freeze dried food and had fun building a campfire. The next morning was a much easier hike downhill and of course was finished off by a visit to Five Guys on the way home. Overall it was a great hike with great weather and great views. Troop 799 visited Pamplin Historical Park, Sutherland Tavern, and Petersburg National Battlefield on the week of sesquicentennial celebrations of the battles there in and around Petersburg, VA. All three places offered different perspectives and acknowledged different aspects of the Civil War itself. We camped out at Albright Scout Reservation due to its close proximity to Petersburg, great campsites, and lack of a camping fee. Pamplin Historical Park is a rather nice museum/ park in Dinwiddie County. At the park, there were fortifications remade to look like the Confederate line looked back in 1865. They used massive earthworks lined with spiked sticks to defend them. These mounds were weaved back and forth and made a rather interesting site. At the park there will still some of the original earthworks from the war about a 100 yards from where we were able to see the real life model of them. Then, a reenactor there gave us a demonstration on how the new rifle of the Civil War, made in the United Kingdom, offered greater accuracy and a new style of warfare. After that, we walked through the Life of the Soldier Exhibit. In this exhibit called “Duty Called Me Here”, we were each given the opportunity to follow the life of the soldier during the war. There was an audio track assigned for each level that you walked through in the museum. In there, a narration would play and then you would hear an update on your solider on a little iPod-like device. In this exhibit were wax figures and props all around the walking pathway that allowed you to feel as if you were there in the war itself. Some of the most interesting parts of the exhibit talked about snowball fights, baseball, and religion during the war. We finished our trip to Pamplin around lunch and then headed to another site. The next stop that we made was drastically different than the marvelous technology and planning put into Pamplin. We drove up to the 19th Annual Southside Virginia Day at the Sutherland Tavern after lunch. When we came up on the site, all we saw were Confederate flags and an old beaten up house. We walked up to find a lot more. There, we met a blacksmith making knives in the front yard, a Civil War Era gun salesmen on the side, and an excavation crew in the backyard. We went around to each station until the next tour of the Tavern started. We received a tour of this old house from a woman named Mrs. Olger and her husband, who currently own the house. The tavern was built by a wealthy Scottish man, Mr. Sutherland in 1803 at the fork of two major roads in Petersburg. The house was most famous for its involvement in the Civil War where it was the site of the Battle of Sutherland Station. This battle was fought in the front yard of the tavern and was actually used as a hospital after the battle. The owner continued to tell us about the blood stains on the wood floor that we were standing on from the battle. The house was filled with old clocks from the time and pieces of artwork that the owners collected and offered a very interesting and personal tour of a historic landmark. Though the owners still live there, the house was kept to look fascinatingly similar to Civil War times. When we realized that we still had daylight, we set out to Petersburg National Battlefield before it closed. We were able to get in the gates just before the Park Rangers closed the park and drive through to the Crater itself. We walked down to the tunnel of the crater and then walked up along the path of it to the actual crater. The tunnel had closed off, so there was only just a peak of what it would have looked like. However the massive amount of land was still there from the Crater explosion. There were small stations that gave the positioning of the troops during this battle and described the magnitude of the event. The battlefield was maintained quite well and though it was quite cold when we visited, the sky and the endless fields of green grass with the Crater in the center of the field with trees surrounding made a stunning spectacle. Each one of these sites that we visited gave a different experience in telling the story of the Civil War which made it a very unique. Overall it was a very successful campout. Troop 799 had 16 Scouts go to the Cardinal District Merit Badge Weekend at Camp T. Brady Saunders. The Annual Troop 799 Yard Sale was held Saturday, March 14th in Trinity Hall at Trinity United Methodist Church. We had a successful sale with support from the Scouts, adult leaders, families, and other members from the community to raise enough money to allow the Troop to run each year. Thank you to Mr. Prideaux for taking pictures.